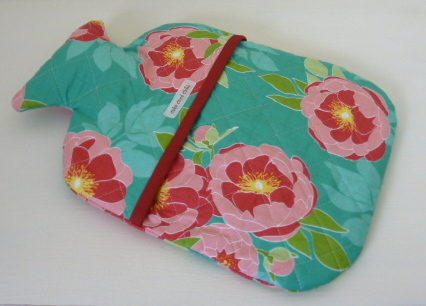 Hot water bottle cover made in 100% cotton fabric with a pretty blue-green background covered in large full-blown pink roses. The inner is lined with a pink spotted 100% cotton fabric and bound with a deep pink cotton. Padded with 100% cotton wadding to make this hottie cover warm and cosy.